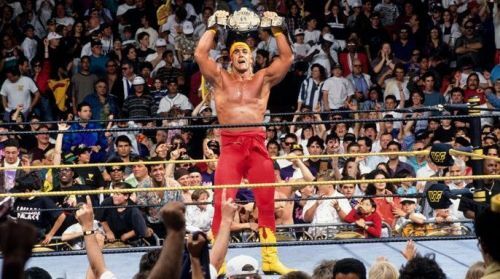 Hulk Hogan hefts the WWE Title over his head. Guess how long it took the Hulkster to win it? Professional Wrestling championship matches are special. After all, the titles are what every wrestler, ostensibly, is striving for. Winning a championship can take guts, determination, and a long time. Sting once wrestled Ric Flair during Clash of the Champions I for nearly an hour without being able to claim the strap, while it took Shawn Michaels more than a sixty minute Iron Man match to dethrone Bret Hart at WrestleMania. Typically, a title match is usually at least twenty to thirty minutes long. This is done in part because the championship match is often the culmination of a long story line or angle. In order to give full credence to both the wrestlers involved and the title itself, the match should feel like an arduous struggle. But that's not always the way it goes. Sometimes, the title's fate can be decided in a matter of minutes--or even seconds! Here are ten of the shortest championship matches in WWE history--Not including Money In the Bank Cash ins, which by their very nature are often short. The matches are arranged from longest run time to shortest. Fabulous Moolah squares off with Velvet McIntyre. For our first super short championship match, we go waaaaay back to the second ever Wrestlemania. In the first Wrestlemania, champion Fabulous Moolah would lose her prized WWE Women's Championship to young upstart Wendi Richter, who was a major figure in the Rock N Wrestling scene. But by the second Wrestlemania, Richter was gone from the company and Moolah was once again champion. The match was not one sided, but was over much more quickly than anyone expected. Velvet McIntyre missed a body splash and was pinned by Moolah, but the referee failed to notice that McIntyre had one foot under the rope. Rumor has it that Velvet McIntyre had a minor wardrobe malfunction, and the match was ended early to prevent any accidental exposure. While never confirmed, McInytre can be seen somewhat awkwardly holding her arms over herself after the match, so it's possibly true.